At Gemporia you can shop for a huge range of jewellery including engagement rings, eternity rings, stacking rings, cocktail rings, stud earrings, drop earrings and hoop earrings, bangles, charm bracelets and tennis bracelets and silver, gold and rose gold necklaces. All of the jewellery available at Gemporia can feature stunning gemstones including sapphire, tanzanite, amethyst, ruby, opal, garnet, topaz, diamond, emerald, morganite, serenite, aquamarine, kunzite, spinel, zircon, pearl and tourmaline gemstones. All of the jewellery at Gemporia is also made with the highest quality precious metals including rose gold, platinum, gold and silver. Shop for your gemstones by type, month or colour and discover blue, pink, green, white, purple, orange, yellow, red and multicolour gemstone jewellery. You can also browse through birthstone jewellery and the multiple collections available, or check out more information on your gemstones using the gemology magazine, the gemology hub and the blog section. The exclusive range of chain necklaces at Gemporia come in a variety of different styles and lengths for you to choose from. Browse around the chain store and discover rose gold, gold and silver couture, classico, detailed, contemporary, classic curb and delicate rolo chains, plus much, much more. All of the chains available at Gemporia are expertly crafted and available at great affordable prices in a range of precious metals. You can shop by metal type, lead colour, gemstone and price to find your ideal chain or you can also check out the Altro Neckwear and Wristwear section for luxurious chain collections that are elegantly designed and finished to the highest quality and standard. Not only does Gemporia stock a huge selection of jewellery it also has a great homeware range where you can find gifts for him and her from under £50 to over £300, as well as gift vouchers of various amounts. In the homeware range, you’ll also find aromatic gemstone infused candles, perfumes, reed diffusers, gemstone whiskey cubes, jewellery holders and even luxury gift boxes. Shop for all of the homeware and gifts available at Gemporia by occasion and discover products for engagements, weddings, birthdays and new births and enjoy great discounts and free delivery on selected items too. When Gemporia dispatches your order they will send you an email letting you know it has been dispatched. If tracking information is available, they will also give you a link to enable you to track your parcel. Gemporia factor in the market price for precious metals and the current availability of gemstones, therefore, their prices will change over time. The carat weights and metal weights quoted in the design details are the average for the design and therefore will vary. Gemporia source high-quality gemstones from locations all over the world to bring you jewellery with the richest of rubies, the most sumptuous of sapphires and the brightest of diamonds. Shop for rings, necklaces, bracelets, earrings and chains that feature a range of stunning gemstones and diamonds and add some gorgeous frosting to your wrist, neck and ears. 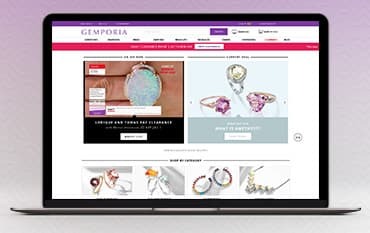 Shop online for your jewellery at Gemporia and discover top-notch pieces at affordable prices, and save even more on your purchases by using a Gemporia discount code from us here at NetVoucherCodes when it’s time to check out.